It’s Full Steam Ahead For Great Adventures With Thomas And His Engine Friends In This All-New Release! Clicky-clack down the tracks as Thomas and his engine friends learn to be Really Useful Engines in the all-new Thomas & Friends®: The Thomas Way available on DVD, Digital HD and Video on Demand December 3, 2013 from Lionsgate and HIT Entertainment. Everyone’s favorite #1 True Blue Engine and his steam team learn that they must work together to stay on track and reach their destination! The DVD, including five great CGI-animated adventures plus a BONUS episode along with a game and puzzles, will be available for a suggested retail price of $14.98. Hop aboard for fun on Sodor as the engines find out that there is always something new to learn! While Thomas and Duck learn how to steam ahead together with a special delivery, Luke and Millie find out what it's like to drive in each other’s tracks - literally! Percy steams straight into a lucky encounter with Bill and Ben, Caitlin gets a lesson in how things are done and Paxton works hard to recover Thomas' lost puff. 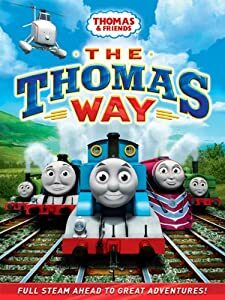 With so much activity on Sodor, it's always important to steam ahead and remember that the best way is the Thomas Way! This makes a great gift for any Thomas the Train lover this year!